Today it became apparent that with the constant spraying of teargas tainted with thinner, strikers are suffering from their skin blistering and peeling off with an extreme burning sensation. With no water in the occupied factory to wash off the toxins, it is becoming a severe health problem. There was also a tripartite meeting between government, Ssangyong management, and the union. The company bosses refused to negotiate until the occupation ends, stating that they won't back down on the layoffs. 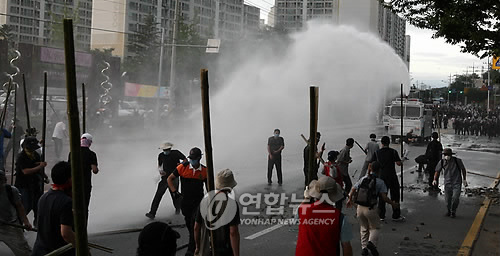 Today, 24 July 2009, is Day Five of the battle over the occupied Ssangyong Motors factory at Pyeongtaek in South Korea. Below is a diagram of the paint department, where most of the occupiers are now holed up. It describes the various flammable liquids that are stored on the 1st and 2nd floors (e.g. thinner, gasoline, diesel, etc. ); there are 200,000 liters of these. This afternoon a committee made up of the families of the factory occupiers staged a sit-in at the offices of the chairman of ruling party in their headquarters in Seoul. Throughout the day the cops continuously sprayed toxic thinner-tainted tear gas from both helicopters and from armored watercanon trucks. The cops maintained positions of about 50 meters from the perimeter of the factory. Strikers occupying the factory are suffering from the effects of the toxicity of the tear gas on their skin. It is still uncertain what the ingredients are, but they are obviously some kind of flammable liquid like thinner. With so much of this flammable liquid being dropped on the roof of the factory's paint department where most of the strikers are, it is an dangerous hazard should some spark set if off. 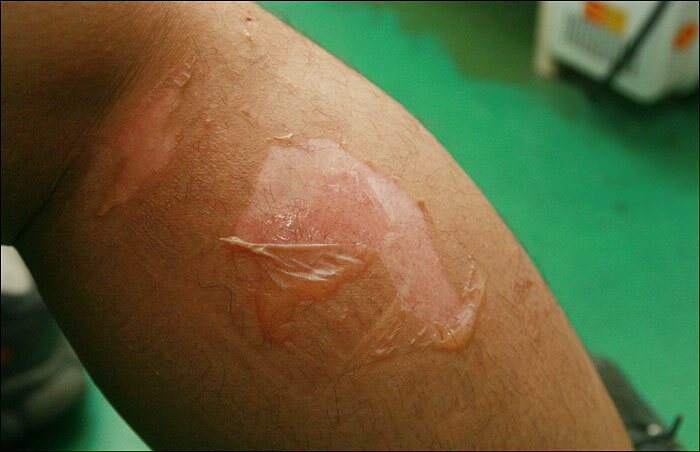 When it contacts someone it causes severe burning and the skin to peel off. It is worried that if coming in contact with someone's eyes, it will cause blindness. Maybe, just maybe, if the fools left the Ssangyong paint plant, the Police would stop dropping tear gas on them. Taking a factory hostage is just not going to work. In this instance, if Ssangyong didn't get rid of some staff, they would have certainly gone totally broke and lost 100% of the staff. Taking over the factory isn't helping this either. It's time the Union and these, so called strikers, gave up. It's pretty obvious that they wont be getting their jobs back. More than likely going to jail anyway. And being sued. Sucked in!! Also, I don't know how they can be strikers when they no longer work for Ssangyong. I think that for now on we can just call them trespassers and trespassing is against the law!! I suspect that when they decided to arm themselves with petrol bombs and long-range sling shots, the strikers probably accepted that their struggle wasn't going to proceed within the legal framework of state supervised conflict-resolution. They were, to use your vocabulary, 'Thinking outside the box.' More than that, they were - and are - showing immense courage, and they're proving that some workers will never passively accept the dictatorship of the economy. Meanwhile, you just sound like a moron. Today the local group of Priama akcia organized a protest meeting in Bratislava. 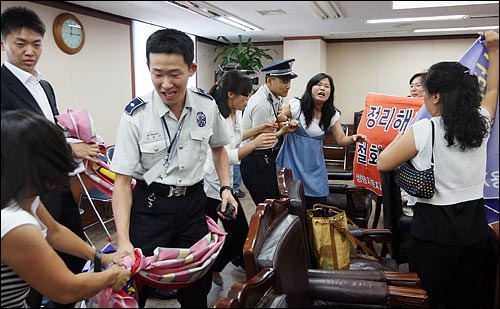 Our members and other activists delivered protest letters to the consul Mr. Byong-do KIM. In discussion with him we expressed our disagreement with acts of Korean police and we expressed our solidarity with the workers. Mr. Byong-do KIM who is familiar with the situation promised that he would inform Foreign Ministry in Seoul about the protest. Due to our call for solidarity the embassy has already recieved a few e-mails yesterday which was a bit of surprise for them. According to the consul negotiations between union and the company officials will start on Monday July 27 (however, according to our info it is possible that negotiations may not start because management refuses to negotiate unless the workers stop the occupation). Priama akcia calls for further solidarity actions. Bravo! That's a great display of solidarity. Starting yesterday (Friday) morning, tripartite talks continued throughout the day. They agreed to meet again today (Saturday) at 10:00 a.m. to try to reach a "peaceful solution" to the conflict. The meeting will be in the factory with representatives from all sides, including the strikers in the factory. If no settlement is reached, it is suspected that it will be used as a justification by the company and the government for a final assault to break the occupation. Despite the meetings pitched battles occurred all day, intensifying in the afternoon and continuing in the evening until around 10:30 p.m. And the cops continued with the constant spraying of the toxic teargas mixture onto the factory throughout, by means of both helicopter and watercanon trucks. The cops and thugs were able to get onto the roof of a building adjacent to the paint department, where they have entrenched themselves in this strategic position. With all the fighting going on, strike supporters held a rally outside the factory which included music. The company played loud noise to attempt to drown them out with psychological warfare. Roof of the paint department (photo from July 23): The top spray-painted slogan reads: "Kill us all if you don't want to talk (negotiate)." The painted one beneath, and to the right, says something about stopping the helicopters. For the vertical banners: the one furthest to the left reads: "Fight to the death for job security for all!." The middle one says: "Punish Shanghai Motors (referring to the company with a 51% stake in Ssangyong Motors, Shanghai Automotive Industry Corporation, a.k.a. SAIC)." The banner on the right says: "Live together!" (because people call the laidoff workers "dead men;" the workers not laidoff are called "living men"). The scheduled tripartite meeting at 10am on Saturday was canceled because the company representatives didn't come to the table. They said as long as the union continued occupation and using violence, they didn't think strikers had intention to solve the conflict. But it' was the company and cops to increase the force, provoked the battles, tried to get closer to the main occupied building all day Friday (it was a real battle field!) while there was the first tripartite meeting, agreeing on a peaceful solution. The 3rd party pressed the company to come back to the conversation, they agreed again, but the date and time was not set up. Meanwhile from 3pm, there was a big rally (one of the organizations was KCTU) in Pyeongtaek downtown to support the occupation (a news channel YTN said 7000 people gathered)click here, the street battles were followed until late night. The police blocked around the factory, the demonstrators couldn't approach the factory. The police(riot cops) number inside and outside the occupied factory is estimated up to 12,500. 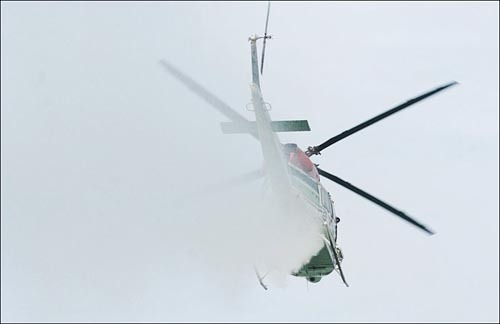 The cops hellicopters kept 'spraying liqid teargas', (not in pouches, not teargas anymore), directly aimed to strikers. The KCTU(Korean Confederation of Trade Union) tried to deliver water (the strikers do not have enough water to drink, no water to flush toilet for days.. people said it's like a refugee camp inside,.. stinks...), but the police and company didn't allow.